Many Nebraska wheat growers are lamenting low yields and talking about the highly unusual weather that led to problems for the 2015 winter wheat crop. But now, between harvest and planting, growers can take steps to help the 2016 crop get off to the best start possible. In the process, they will be good neighbors to fellow producers. Despite abundant moisture, wheat yields across the Panhandle suffered due to a combination of factors, most of which were weather-related. 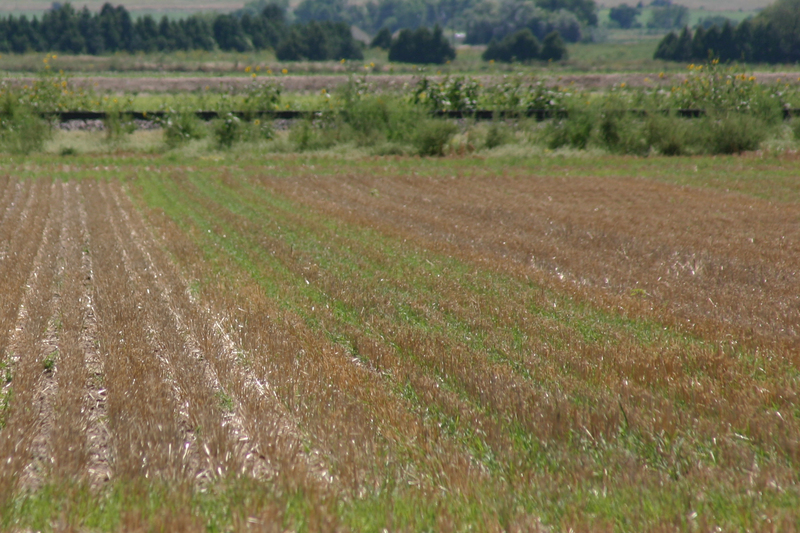 Winter temperatures fluctuated, causing wheat to winter kill. Relentless spring rains and cool temperatures delayed spraying and created an ideal environment for leaf and stripe rust to thrive. In May, a snowstorm that hit when most wheat was in the boot stage or heading out caused freeze damage. In addition, hailstorms across parts of the Panhandle destroyed any wheat in their path. Two notable storms passed through Banner County and near Hemingford. Not only were growers in these areas not able to harvest wheat this year, they are now at risk for problems next year. Hailed out wheat quickly becomes green volunteer wheat that can host numerous pests, including mites which transmit diseases like wheat streak mosaic virus (WSMV) and high plains virus. Of these, the most worrisome is wheat streak mosaic virus because of its ability to completely decimate a wheat field. Symptoms of wheat streak mosaic virus are visible on the youngest wheat leaves as a yellow mosaic pattern of parallel discontinuous streaks. Over time, this will become mottled yellow and appear similar in some ways to barley yellow dwarf virus symptoms. Typically after wheat harvest, wheat curl mite activity decreases significantly because of the lack of a suitable host plant. However, volunteer wheat, especially wheat that emerges prior to wheat harvest due to a hail event, can provide the mites a suitable habitat to survive until winter wheat is planted in the fall. This is known as a "green bridge." Other crops and summer annual weeds can serve as a green bridge, including corn, oats, sorghum, and millet as well as goatgrass, cheatgrass, foxtails, barnyardgrass, and stinkgrass. The greater the density of the grass weeds, the greater the risk. In addition to serving as hosts to mites, volunteer wheat and weeds use valuable soil moisture that could otherwise be used to grow next year's crop. In addition, uncontrolled weeds will produce seeds and create future problems. The most effective way to protect against wheat streak mosaic virus is to destroy the green bridge using tillage or herbicides. Chemical control will likely require two applications. The first will control the initial flush of volunteer wheat and weeds. The second should be completed two weeks prior to planting winter wheat. Other prevention methods need to be used when the mite source includes a crop. Ideally, the crop would be harvested early enough to allow for control of any remaining potential hosts two weeks prior to planting winter wheat. In many instances the crop, such as with corn, will not fully mature and be harvested until after wheat planting. There are two methods to manage wheat streak mosaic virus when planting winter wheat in high-risk situations. First, avoid planting early and plant high-risk fields last. Second, plant tolerant varieties either in the entire field or in a strip near the likely source or mite infestation. Mace is a variety resistant to wheat streak mosaic virus. A number of other varieties are moderately resistant. Mites travel using the wind, but usually will not travel too far. For this reason, initial infestations usually occur around field margins near the mite source and move with the prevailing wind. Understanding this will help to develop a plan to mitigate risk. Be thoughtful and communicate your plans with your neighbors. Know where your neighbors anticipate planting winter wheat and control potential mite hosts nearby, especially if you suffered a hail storm. Control volunteer wheat and remove hailed out corn quickly to prevent a possible green bridge. If corn is slow to mature in the fall, use caution when choosing to plant winter wheat nearby. Prevent and plan now to have a successful wheat crop next year.